I hope this reaches you well. I wanted to provide some meeting and event updates in this weeks email. Please read below and see what the Men's Club will be up to this month and next. We hope you will find at least one event and possibly more that you would like to attend. Please mark your calendars and plan on joining the Men's Club as we Co-sponsors the New Members and Congregational Dinner on Friday February 22, 2019. Services will begin at 6:00 pm and dinner will follow starting at 7:15 pm. You have heard of the show "Guy's Grocery Games" and "Chopped", right?...Well now come and experience a taste of them both for yourself. Please join the Men's Club as we host our 2nd Annual...Cooking Competition. 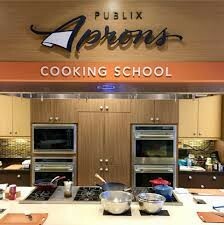 This event is open to all individuals/couples and will be held on Sunday February 24th from 3:00pm-5:30pm at the Publix Aprons Cooking School (5400 Windham Forest Dr Glen Allen 23059). This event has a minimum of 8 people and maximum of 24 who can attend. We will be split up into two teams and will be cooking a dairy style meal against one another using ingredients from right in the grocery store. The Apron's Chef's will be by your side to assist, show you cooking techniques and answer any questions. After the meals are prepared, the Publix Managers will judge both teams dishes and declare a winner. Come join in the fun!!! After the cooking competition, will then sit down to a nice gourmet (separate from the competition meal) prepared dairy meal from the Apron's Chef's. If interested, please sign-up as soon as possible as we expect spots for this event to sell out quickly. Cost: $50 per person. Upcoming Events in March: Mark your Calendars!! Thank you for your support of the Temple Beth-El Men's Club. If you should have any ideas or comments, please respond to this email.